Following is a one page jumble of my (too) many areas of interest and research. My interest in MG's goes back to the early high school years. My folks planned on handing me down the '57 Chevy, but I was more focused on those small, open top, long hood, swooping fendered cars I saw darting through traffic. My friends and I plotted and planned on how we could get our hands on a sports car. In our senior year, Lou showed up in an MG TD, and my first ride in that car made me determined to have a TD of my own. Paul (another sports car dreamer), found a book titled "How to Buy a Used Sports Car" by Christy. That book had a chapter devoted to the MG TC...and I was sold! In February 1967 I somehow convinced my folks to loan me the money to buy a TC (chassis #5221 built April 8, 1948). Repaying that loan took two years of part-time work including a summer job at the Dole cannery. Abingdon Rough Rider / LA TC Motoring Guild 43rd annual conclave, Sierra Sky Ranch, Oakhurst Calif., Oct 1-3, 1999. Red TC, left photo, nearest is #5221. 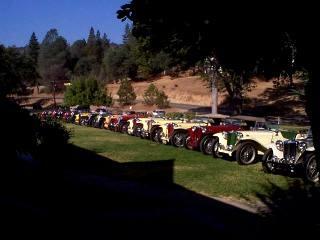 There are 17 MG TC's in line-up. The two TC clubs have been meeting half way between LA and SF since 1957. The Sky Ranch photo is one of our best line-ups. The photo below is the 48th Conclave was at Cambria, October 8, 9 & 10, 2004. We had 15 TCs at the event, 14 made the 'line-up'. The location is Moonstone beach near Morrow Bay. Our latest, 60th Conclave was in San Luis Obispo October 7th thru' the 9th 2016. I believe we had 17 TC's; 14 in the traditional line up. The MG TC was built from November 1945 until November 1949 at Abingdon, England. 10000 (#0251 to #10251) were made and ~2001 were shipped to the USA. The first MG's were modified from Morris cars in about 1923 for those wanting more power and performance. The first production MG (Morris Garages) was the M type (1929 to 1932) using Morris chassis and components. The first MG that was designed from the chassis up was the J2 (1932 to 1934). I have had the TC since 1967, driving it to school and work until 1970 when I retired it with a 1967 MGB / GT. In 1971 I bought a 1933 MG J2. The TC I drove about 80,000 miles, from San Diego to Vancouver Canada and as far East as Denver Colorado. The MGB/GT I have driven 280,000 miles (retired in 1989, awaiting restoration). The J2 was purchased as a "basket case" and is just emerging from a dormant restoration and I hope to have it on the road by...2017. My interest in "old iron" dates back to the pre-school years. My parents were in gold and tungsten mining in the Greenhorn Mountains, east of Bakersfield, California. We lived in a log cabin on the Caliente-Bodfish Road. No electricity, no gas, no plumbing, wood for warmth and cooking, a cool clear spring for water. I grew up around mining equipment, clambering up and down mine shafts, creeping through dark damp tunnels. I was fascinated by the big diesel engines, rock crushers, ore cars, concentrating tables. We had a dump truck, a 1927 Moreland truck with chassis mounted Waukesha engine driving an Ingersol air compressor, a 1936 Dodge school bus converted into a first class motor-home and two Model A Fords for getting around; my favorite one was the 1929 with soft top and rumble seat. When I was six years old we moved back to civilization, San Bernardino, California. Although most of all that cool "old iron" and Fords stayed behind after the move, we spent weekends and summers exploring mining camps and ghost towns through-out the Southwest states. We moved to San Jose, California in 1962 and since 1980 I have been collecting locally manufactured historic "old iron" and researching the people behind those companies. For the past thirty-eight years I have been half owner of Clover Machine & Manufacturing, located in Santa Clara, Calif., making components for lasers, ultrasound and other hi-tech medical equipment. We founded the company in a garage, not knowing anything about running machine tools, to build obsolete parts for, what else?, MG's. After a few years we began to receive requests for prototype work from local hi-tech companies, and that lead to volume production. Now, when I need an MG part I have to buy it from someone else! Following are two of the more interesting items from my low-tech / old-tech collection...with a little history thrown in. Me and the Ostenberg Gas Engine. 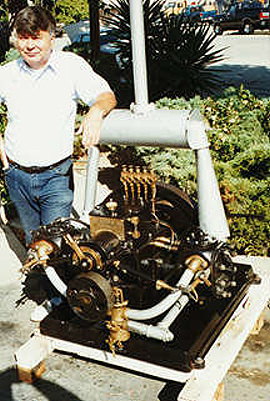 The Ostenberg Gas Engine was built in San Jose, California from 1903 to 1912 by Swedish immigrant John Ostenberg. John was the designer and factory superintendent of the Abenaque Gas Engine Company of Vermont. He and his family moved to San Jose in 1898, purchasing a 15 acre orchard off Redmond Road. Today the orchard is a housing tract, but Ostenberg Drive marks the family home site. The factory was located in the "Willows" near the present corner of Bird Ave. and Willow St. The factory was sold to the John Bean Spray Company in 1912 and production continued for three more years. Bean redesigned the engine in late 1913 and called it the "Bean Double Opposed" engine. It is unknown if production serial numbers started at 1 or 100, but production stopped at serial number 434. The oldest engine, of seven survivors, is #129 the newest is #355. The change of ownership occurred between engine #236 and #290. This engine is #227. 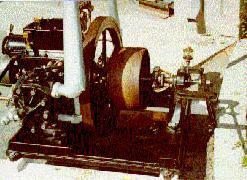 The Ostenberg Gas Engine was built in 10, 15, 20, 25, 32 and 40 horse, all identical in design just larger. All the Ostenberg engines were ignitor fired. The Bean Double Opposed engine used a Bosh DU-2 HT magneto and spark plugs. This above engine is a 10 HP, 43" wide from cylinder head to cylinder head, weighing 950 pounds. For comparison, the 40 HP was 76" wide from cylinder head to cylinder head, weighing 3800 pounds. One 40 horse survives, one 32 horse survives, one 20 horse survives and four 10 horse survive. 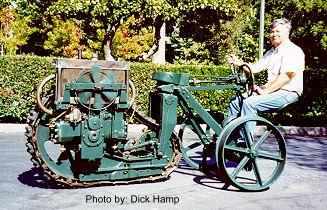 Only one of the seven surviving engines is a Bean Double Opposed, it is a 10HP and has just returned home to San Jose. Rumored engines are: one that was donated to a local museum and has since disappeared (Double Opposed) and one buried in a pump pit on a San Joaquin Valley ranch sixty years ago. I have a name plate and exhaust system from 40 HP engine #123. I am interested in learning of John's family history in Sweden. He was born September 30, 1859 to Frank and Kathleen (Johnsson) Ostenberg. Any information will be appreciated. Not much is known about this machine patented by James H. McCollough in 1927 (granted 1929). The original owner claimed it was purchased from the John Bean Spray Co., San Jose, California. James H. McCollough and Alfred C. Johnson teamed up in 1906 to form a 30 year partnership designing and building some of California's early gasoline powered farm tractors. Their first production tractor was built in 1910 at Sunnyvale. The factory was soon sold to the Joshua Hendy Co., also of Sunnyvale, and production continued until about 1913. 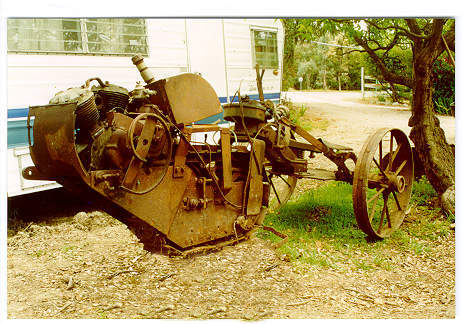 That tractor was the Johnson Improved Tractor and the only known survivor is located at the Pioneer Museum, Paso Robles. Hendy sold the rights for this tractor to the Rumley Company of Racine Wisconsin and a small number were built as the "Rumley Toehold" tractor. In 1912, Alfred Johnson, James H. McCollough and Fred Calkins of San Jose, acquired a 2/3 interest the ball tread patent of Mr. Clarence Henneuse and development began on the "Calkins & Johnson Ball Tread" tractor. The Ball Tread tractor company was headquartered in San Jose for a short time until bankruptcy forced the sale of the company, located on South First St., to the Yuba Construction Co. of Benicia. Their next tractor was developed and built in San Jose and was very quickly purchased by the John Bean Spray Co., and built at their Julian St. factory. That tractor was the famous Track-Pull built from 1915 through 1921. The Track-Pull was a design predecessor to the machine pictured here. Johnson and McCollough were retained by the John Bean Company to continue developing the design and production methods. James H. McCollough maintained offices in the First National Bank Building, San Jose, from 1920 through 1927 as a tractor designer. By 1930, as the great depression took hold, he was in real-estate, probably developing his Sunnyvale orchard for much needed cash. He then vanishes from the record books for a few years, and in 1935, surfaces in Alameda where he and Johnson again try their hand in tractor design and production, building a similar but smaller machine called the "Unitrack". The Unitrack used an Indian motorcycle engine for power. One Unitrack is known to survive (serial #11). Alf Johnson continued to design and consult for the John Bean Spray Co. and their successor, Food Machinery & Chemical Corp., until his death in 1954. He died while developing a new tractor at a field trial in Sunnyvale. This machine is the only known example of perhaps a very few built and was little used as all internal mechanical parts show no wear or abuse. The engine is 2 cylinder opposed displacing 88 cubic inches with ball bearing mains, phosphor bronze connecting rods and cast iron pistons. The transmission is planetary, using model T Ford components allowing one speed forward and a very slow reverse. 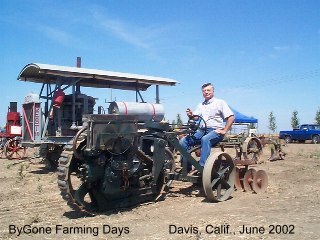 The University of California Davis has a photo of this tractor on field trial but without the radiator (condenser) and fan. It appears they initially tried to use a hopper cooling system but was found to be inadequate. I am also interested in the family history of James McCollough and Alfred Johnson. James McCollough was born in San Francisco, California in 1881. Alfred Johnson was born in Iowa 1881, but the family soon moved to Winters California. 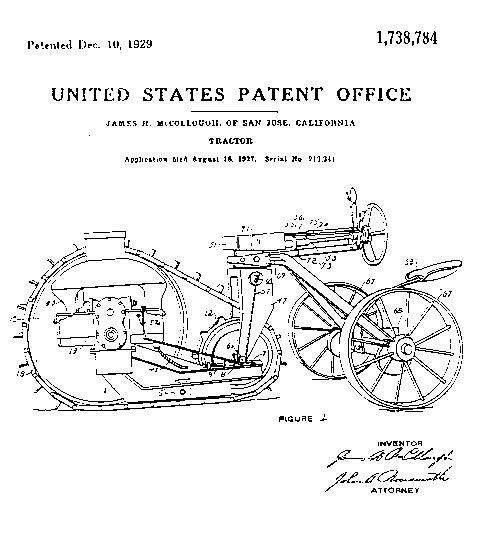 Patent drawing of the 1927 tractor. Use the browser "back" button to return. Photo of the 1935 Unitrack. This is a 15 inch track gauge model of a Shay locomotive built to 5" to the foot scale by Ken Kukuk. I have not built one of these engines but have contributed to some of the locomotives built by our network of "15 inch gaugers". 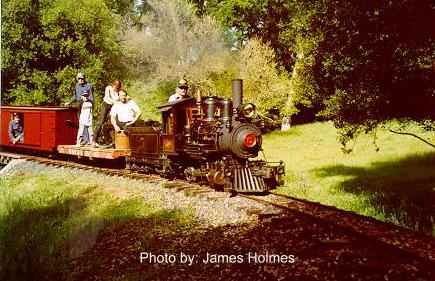 This railroad is the Redwood Valley Railway located at Tilden Park in the hills above Berkeley Calif. There are about ten 15" gauge railroads in our State. My "home road" is the Glenwood South Park and Pacific located in the Santa Cruz mountains West of San Jose, and the Shay is GSP&P #7. Robert Beuttler is the engineer (on left) in photo and I am (on right) "firing". The locos are diesel oil fired with a boiler pressure of 150 to 200 pounds/sq inch. Firing the engine is more fun than driving. A fireman has to adjust the fire for maximum efficiency and believe me efficiency is necessary! The GSP&P has 8% grades to climb and the Hetch Hetchy & Yosemite Valley near Toulumine, Calif., is a 25 minute round trip. The water in the boiler must be kept at the correct level by use of injectors. Too much water and it will work into the cylinders causing mechanical disaster, too low and the crown sheet (between the fire and the water) may warp resulting in expensive repair. The fire must be regulated constantly according to road conditions. Running down-hill, on the level or up-hill is each a balancing act of the roar of the fire and the force of the injectors. The engineer's job is no piece of cake either. The throttle valve must be operated with a fine touch. Opening it too much and the locomotives wheels will spin and the fire almost certainly will be pulled out of the fire-box necessitating a shut-down of the fuel system and going through the relight procedure. The engineer is responsible for train braking and safety. The brakes are air operated from a reservoir supplied by a steam air pump. On a long downhill run the air reservoir can be depleted by inexperience and a runaway train without brakes can be disastrous! 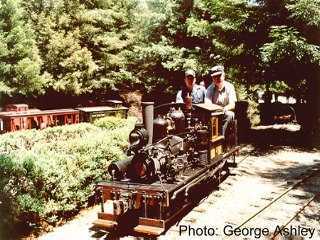 This is GSP&P's #5 climbing a grade on the Hetch Hetchy & Yosimite Valley's Railway. Engineer is Gerry Hanford. Erich Thomsen, in blue shirt, is standing on flat car and Ken Kukuk is inside the box car. Most all of of our equipment is based on Erich's designs. He was the roadmaster for the Western Pacific Railroad for 27 years and made a study of all aspects of railroading. Ken is the builder of the Shay and the #5. CLICK HERE to go to the GSP&P Railway page. Currently, I am not actively volunteering on any projects, just too far behind on my own! I spent 10 years helping to restore and operate the M. V. Suisun, an ex Army Corps of Engineers survey motor vessel built in Astoria Oregon in 1914. It's engine was built in Petaluma, California, by the Corliss Gas Engine Company. The Suisun is 86 feet long displacing 72 tons in cruising trim. The Corliss engine is 175 HP 6 cylinder 10" x 12" bore and stroke weighing 18,000 pounds. Both the vessel and engine survive but no longer together due to explosion and fire in 1987. She was constructed of the finest materials available. With a crew of fourteen she surveyed the California coast, San Francisco Bay and Delta to make sure the commercial waterways were clear and open. Survey work included the fill for the Panima Pacific Exposition of 1915, the construction of the Carquinez Bridge and always on look-out for illegal fishing activity. In her "grand salon" dining room many area notables were dined including Sunny Jim Rolph the flamboyent mayor of San Francisco. 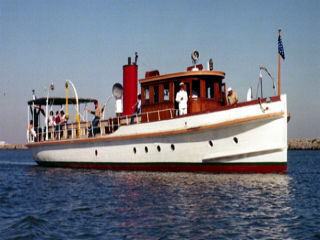 The Suisun was retired from government service in 1931 and purchased by the Skaggs family, owners of Safeway and renamed the "Virginia S.". Her log books are a wealth of historic information. For instance, on May 2, 1915 she motored up the Guadalupe River, from Alviso toward San Jose, four miles with an average water depth of twenty two feet! Today the Guadalupe is more like a creek than a river. In 1954 the Suisun was used to film John Wayne's "Blood Alley". Mr. Wayne is reported to have come aboard very late one night, with whisky bottle in hand, lowdly asking if "anyone aboard this boat, alive or dead, will have a drink with me!" One of our last trips was to take seven astronauts on a tour of the San Francisco Bay. They were members of the Association of Space Explorers, the international professional society of astronauts and cosmonauts. We had aboard Rusty Schweickart, Apollo 9; Alexi Leonov, first man to walk in space, and five others from Russia, East Germany, Saudi Arabia and America, and a boat load of officials and KGB body guards...complete with fedora hats and trench coats. In the wheel house I spoke to five of the Russian officials as they asked the history of the boat, the surrounding sights etc. One of them just smiled and never said a word, so I figured he did not understand me, but I pretended he did. Later, as they were leaving, he grabbed my hand and said "thank you for speaking to me, Bill". I asked Mr. Schweickart who he was...the head of the Russian space program! Another of the engine crew, Chuck Hopkins, and I found Mr. Leonov alone in the dining salon and told him it was an honor to have him aboard. He placed three drinking glasses on the table and 1/2-filled them with 80 proof Stolichnaya Vodka and proposed a toast to the American and Russian people in friendship, and proceeded to knock back the whole glass...we did likewise. As I set my glass down it was filled again in toast to the American space program. I set that glass down for the third time, wondering what my mental state would be in a few minutes...it was filled again!...in toast to the Suisun's crew volunteering their time to the restoration of the vessel (which he wished he could take home to Russia). I didn't set my glass down for a fourth round...and still have the empty bottle of Stoli as a reminder of that day. Reciently, I learned form a Russian that when you have had enough of toasting, you smash your glass, or, place it on the table up-side down. I wonder if he was impressed with us. Our Chief engineer, Tom Walsh, suggested I take our engine room log book and have all the astronauts sign it. One of the astronauts, Loren Acton, over-heard the suggestion and volunteered to introduce me to each of the space voyagers. After making the rounds he wanted to see who we had missed...Rusty Schweickart. Feeling cavalier after the three glasses of Stoli, I said "hey,where's Schweickart!". A man standing right behind me said "I'm Schweickart!" I felt like a small rodent; disrespectful to a national hero. Mr. Schweickart gave me a big smile and said "shure, I'd like to sign your log". I worked on the steam tug Hercules one or two Saturdays each month from 1980 to about 1988. Myself and several others scraped paint and rust, polished lots of brass and retubed the boiler. A new group moved on board in 1988 and has taken all the credit for bringing her back to life. My hundreds of hours of labor and donated machine work do not appear on the contributors board. The Hercules is located at the Hyde Street Pier, San Francisco, and is the property of the National Park Service. I have machined several items over the past years for our antique trolley cars that operate here in San Jose, and have helped (a little) in re-assembly of the San Jose History Park's (Kelley Park) Port Huron steam traction engine. I am currently on duty one or two weekend days each month as a docent/host at the Kelley Park Trolley barn. My mom had not been doing well for awhile and was diagnosed with an inoperable lung/aortic tumor in June 1975 and we lost her in December of that year. My father soon was diagnosed with ALS (Lou Gehrig's) and began a rapid decline. I dropped out of SJSU in 1975 (9 units short of a BA), eventually quit my job and took care of him at home 24/7. 1975 thru' 1977 was a difficult time and I lost contact with many wonderful people. Anyone who worked for Mail Delivery Service Company ( MDS ), San Jose, California., 1968 to 1976. San Jose State University, 1970 to 1975. Marilyn Hopper MDS 1974/1975 & SJSU (elementary education) 1972/1977,Home town: Ventura, California. Photo June 3,2014 of the San Jose MDS employees at Sara's Kitchen, Santa Clara, California. Some of us started with the first or second offices located on San Pedro St. San Jose that were prior to the Bassett St. Office; 1968 - 1974. The first office on San Pedro St., was a small desk in a un-used corner of the Rose-Murty Tire shop. That was just before 'my-time' and probably why all our vans forever-after ran on their $6 recaped tires!...loyalty. There are others who live too far away or their work schedules too tight to make our lunches but keep in touch. Bob happened to be visiting from New Mexico. Why are we still friends after nearly forty years...because many of us were friends long before employment at MDS. 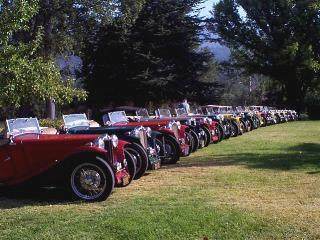 Some from grade-school, college, four of us pictured owned T-series MG cars, four of this group are active sail-boaters, two often fish the Sierra rivers and are MG car guys too. One of us is a combined artist, boat builder/sailor, an MG owner and a fisherman. Two of us are grade-schoolers and MG owners. Many of us discovered common interests at the company. A Venn diagram of our group would be interesting. I have to say that more than half the fun of these projects involving old cars, tractors, steam locomotives, boats etc. are the friends I have made over the years. We have shows, tours, conclaves, BBQ's and share information for all the books we intend to write...someday.